We know that a mobile phone is not an ideal storage media to store important data because we can not guarantee that our phones will never be lost, broken or stolen. Then, what do you do to protect your private information, such as text messages that stored on your phone? What about printing them out to a piece of paper? Still looking for a way to export text message conversations from your ZTE phone to computer so as to print them out? Do not miss Coolmuster ZTE SMS Transfer. It is absolutely secure and effective, which does a great job in backing up files from your Android phones to computer, without altering your original data and system. It helps you export text messages from ZTE Nubia/Grand S/N909/N5 to computer and saves the exported SMS as printable file format. Enjoy an efficient data management of your Android device with this versatile program right now. Next, we will tell you how to export ZTE text messages to computer and print them out. How to Get ZTE Text Messages Printed Out? At first, connect your ZTE mobile phone to computer via USB and open the installed program on computer. 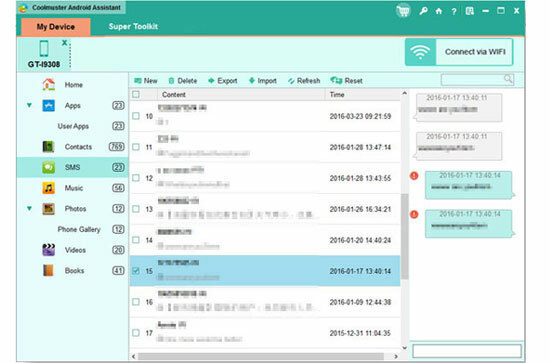 The software will detect your ZTE phone automatically and you will get the primary interface like below. If you want to print out text messages from ZTE, you should export them to computer first. In this step, you need to select the "SMS" folder, preview all the scanned out text messages and tick off those you want to export. After you have selected all the ZTE messages you want, you can tap on the "Export" button. Then, you will save all text message conversations on PC effortlessly.